Check Out The ‘Independence Day 2’ Trailer Starring Bill Pullman’s Beard!!! Coming June 24 is the sequel we’ve waited 20 years for. The action-packed movie stars good combination of returning stars and new to the franchise, Liam Hemsworth, William Fichtner, Maika Monroe, Joey King, Jeff Goldblum, Sela Ward, Bill Pullman, Vivica A. Fox and Brent Spiner. We always knew they were coming back. After ‘Independence Day‘ redefined the event movie genre, the next epic chapter delivers global spectacle on an unimaginable scale. Using recovered alien technology, the nations of Earth have collaborated on an immense defense program to protect the planet. But nothing can prepare us for the aliens’ advanced and unprecedented force. Only the ingenuity of a few brave men and women can bring our world back from the brink of extinction. 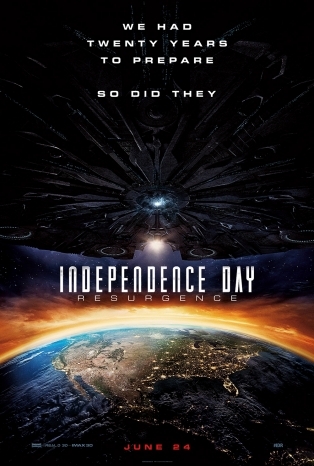 Check Out The ‘Independence Day: Resurgence’ Trailer!!! ‘The Possibility Of Fireflies’ Lands Joey King & Courtney Love For Movie Adaptation!!! Jeff Goldblum and Bill Pullman Will Be Returning For ‘Independence Day 2’!!! This entry was posted on Friday, April 22nd, 2016 at 12:23 pm	and is filed under Film, News. You can follow any responses to this entry through the RSS 2.0 feed. You can skip to the end and leave a response. Pinging is currently not allowed. « Is ‘Three’s Company’ Heading To The Big Screen?!? !